Fifth-grader, Dave Packer can't take it anymore. That Lynsey Burgess just never stops talking, and she really doesn't have anything to say anyway. Dave and Lynsey agree to hold a contest,-,boys against the girls. No one can say more than three words at a time. That's right - three-word sentences! Anyone who adds an extra word costs his/her team a point. They have to stick to the rules at home, at school, everywhere. Can they do it? The teachers start wondering what's going on? 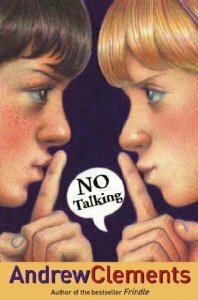 They're glad at first that the 5th graders have finally stopped talking, but after a few days, the teachers don't like what's going on. Very interesting. The book hook you to it making you never wanting to stop reading. Dave VS Lynsey, both fight to don't talk. Then the whole school started it. Who will win? What will happen?